In 2004/5, over half of IT professionals will be looking at open source, most for the first time. This book provides key tools for System administrators, Network Administrators, IT project managers, and consultants who must evaluate and deploy open source software. 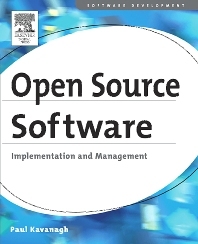 This book details open source successes so far, explains which scenarios are the most realistic opportunities now, then gives the details needed to select these solutions, adopt the best tools and practices, introduce them to an organization, implement and manage them. The IT professional can use this book to review opportunities in their organization, evaluate components such as Apache, Linux, and OpenOffice against systems they know, and follow up in detail on their specific interests here and through referred resources. Systems Administrators, Network Administrators. IT project managers, and consultants. Paul Kavanagh was educated in the UK and has twenty years experience in business IT consulting in the United States. He is currently President of KATS, a technology consulting practice based in Miami. From 1994 to 2002, Mr. Kavanagh managed teams of Microsoft consultants serving Royal Caribbean, American Express, Burger King, Patagon/BSCH, Yupi, Harris, State of Florida, United Airlines, Kraft Foods, McDonalds and others, built a Southeast evangelism team, and delivered MSDN events to thousands of developers. From 1981 to 1993, Mr. Kavanagh was a VP for AGS Computers, a Verizon company, ran a business unit which sold and delivered UNIX solutions and training primarily to IBM, and developed financial systems for Merrill Lynch, Chase Morgan, and NYMEX among others. He lectured on practical software development at De Paul University and on UNIX internationally and developed AIX administration manuals for SRA. President of KATS, a technology consulting practice based in Miami.